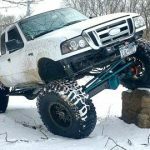 This article appeared on tennesseeoffroad.com, but is no longer available. It has been found at the Internet Archive and has been preserved here. Don’t ever try and straddle rocks. 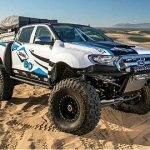 For instance, if a vehicle that has 8″ of ground clearance will not make it over a rock that is 10″ tall. Remember, if you hear something scraping while going over a rock, don’t panic. It’s probably the rock scraping your skid plate or frame. This will not hurt your vehicle. It’s what they’re there for. 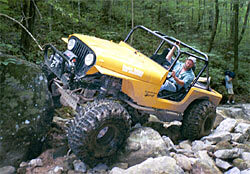 When rockcrawling, you should be at idle speed (1-3mph). Do not try and race up a rock. 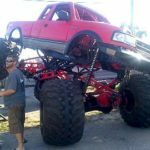 This can result in broken axles, driveshafts, etc.. Always try and stay on top of the rocks. Hills are one of the most dangerous obstacles in four wheeling. Hills have claimed many vehicles over the years. Most people will attempt to climb small, steep inclines, but not many go for the super long and steep hills. Those that try the long hill climbs and are successful, know the limitations of their vehicles and are experienced drivers. If you feel uncomfortable about climbing up a hill, don’t try it. When driving up or down a hill, always try to go straight. If you start going at an angle, it might cause the vehicle to start the rolling process. Keep your wheels on the ground at all times. As stated earlier, the more your vehicle bounces, the greater chance it has to break parts, important parts. When going up a hill, the best type of soil condition is damp soil. 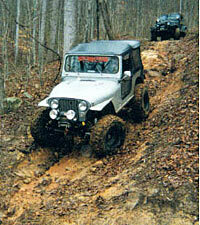 It offers you a lot better traction than muddy, dry, or loose. 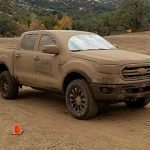 Muddy, dry and loose cause the vehicle’s tires to spin out and loose traction. When approaching the top of a hill, make sure you know what is on the other side and ease up on the gas. You don’t want to go flying over the hill and end up in some crazy position. 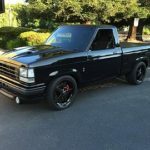 You should apply the most power to your vehicle when you start going up the hill. This gives you more momentum for the ride up. When you are going down a hill, keep your foot near the brake pedal. If you need to use your brakes, use them lightly, too hard will cause your wheels to lock up and you could start sliding. If you start to slide, remember the rules of snow and ice, turn in the direction that you are sliding. Always use low gearing when driving down a steep hill. ALWAYS know what kind of mud you are going through. 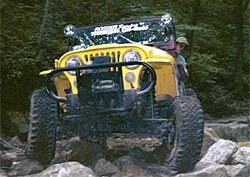 Be sure that you know how deep the mud hole is and if there are and rocks or logs at the bottom (tire poppers). 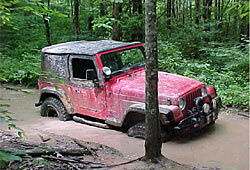 On some trail rides, vehicles have gone into a mud hole and come out with a busted tire because they did not know about the rocks at the bottom. 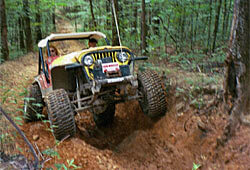 While going through a mud hole, turn your steering wheel back and forth so the tires can find traction. If you happen to get stuck, try backing up and going forward again. If this doesn’t help, try backing out of the hole. Spinning your tires will only make the hole deeper and you will find yourself in deeper mud than when you entered the hole. A word to the wise: If you see tracks going into a mud hole and don’t see them on the other side, think again. 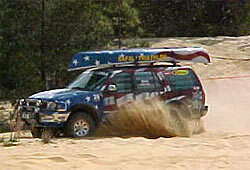 When driving on sandy trails or open desert, make sure that you have good steady speed. 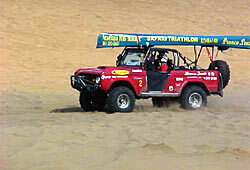 Use four-high when driving in the sand. It is a good idea to air down your tires as well. Use should usually have them between 8 and 10 lbs of pressure. If you happen to get stuck, there are a few things you might try. 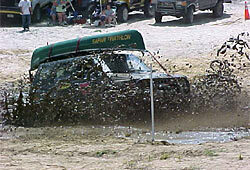 The first one is wetting the sand around you to give you more traction. 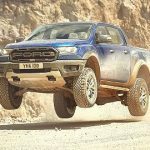 You might also want to place your floor mats under the tires for traction. You can also try digging out around the tires and placing an object under your tires. 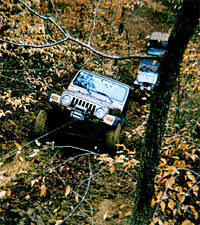 If you don’t have either one of the things, try using a Pull-Pal or other winching device. If all else fails, radio or call for help. Ruts can very tricky on the trails. 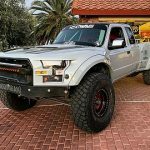 Some trail conditions make it where you have to drive down the side of a rut, straddle the rut and then end up in it, or even one that you cannot get out of.When you see that the trail ahead of you is a big rut and you’re sure that you will end up in it, try and straddle it. If it starts to get wider, ease down into it. 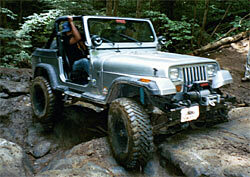 Keep your vehicle level and try to ride the sides of the rut with the sides of your tires or sidewalls. Make sure you have a spotter to guide you through the rut. Remember, even if you know the trail like the back of your hand, trails are always changing and eroding. Keep your vehicle centered and level as possible while in a rut when possible.